Ground source heat pumps (GSHPs) use pipes that are buried in the garden, to extract heat from the ground. This heat as a result can be used to heat radiators, underfloor heating, warm air convectors and to heat water. A ground source heat pump circulates a mixture of water and antifreeze around a loop of pipe, known as a ground loop, which is what is buried beneath your garden. 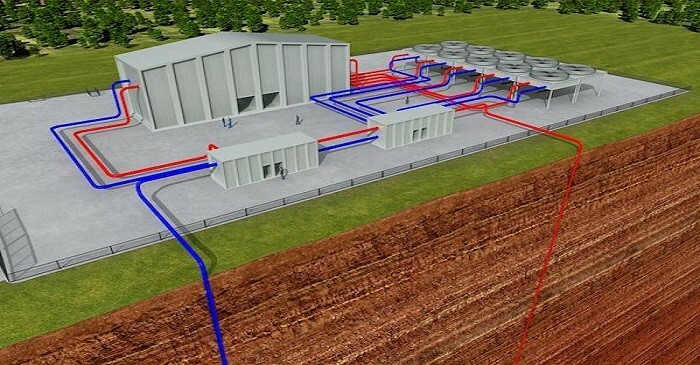 Heat from the ground is then absorbed into the fluid and is then passed through a heat exchanger into the heat pump. Beneath the surface, the ground stays at a moderately constant temperature, allowing for the heat to be used throughout the year. The length of this loop solely depends on the size of your home and the amount of heat you may need. The longer the loops the more heat they are able to draw from the ground, although they need more space to be buried in. If the space is very restricted then a vertical borehole can be drilled into the ground instead. The advantages to ground source heat pumps are that they can lower your fuel bills, especially if you replace conventional electric heating. They can also provide you with an income via the Renewable Heat Incentive (RHI), lower your home carbon emissions. They require little maintenance and no fuel deliveries; they can also heat your home as well as heating your water. Ground source heat pumps deliver heat at lower temperatures over the duration of long periods of time, than gas or oil boilers. During the winter period they may need to be constantly on in order to heat your home efficiently. With ground solar heat pumps you will notice that when you come to touch a radiator it won’t feel as hot as when you use gas or oil boilers. Installing one of these systems can cost around £13,000 to £20,000. Other running costs will depend on several other factors such as the size of your home and how well insulated it may be.